I want to turn my living room into this. Every moment of their happy day was beautiful. 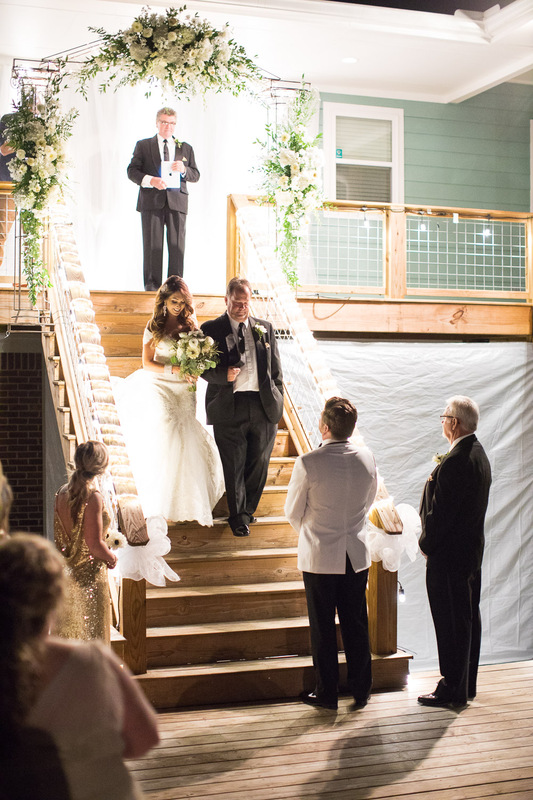 Michael and Juliana chose to say "I do" at a wonderful location, Juliana's family's riverside home. 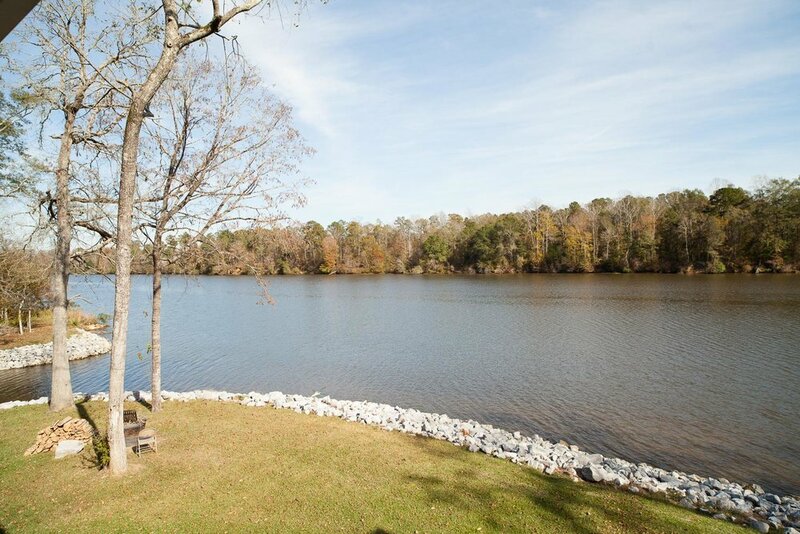 Located in a secluded, remote bend of the river near Columbus, it was a gorgeous place to be on a perfect November day. This was our first riverside wedding in Columbus, but I hope it won't be our last! Juliana's bridesmaids gave her such a meaningful gift - they marked their favorite Scriptures in a beautiful keepsake Bible. These sweethearts were the center of a happy swirl of activity! 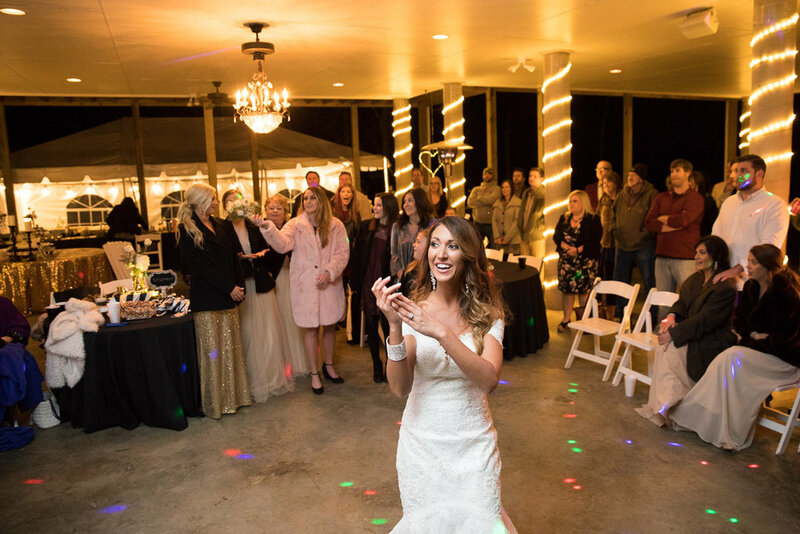 While we were playing with all the beautiful details and capturing sweet getting ready moments, friends and family were EVERYWHERE, cooking, setting up, decorating, and helping create this amazing day. And while everyone worked, we were treated to views like this! I LOVE THIS SIGN. If you want one just like it, contact Stephanie Herring of Southern Made Designs! Our son Eli served as our assistant and behind-the-scenese shooter, and many of these images are his! Y'ALL. He caught some of the BEST moments! I'm totally jealous of this one. 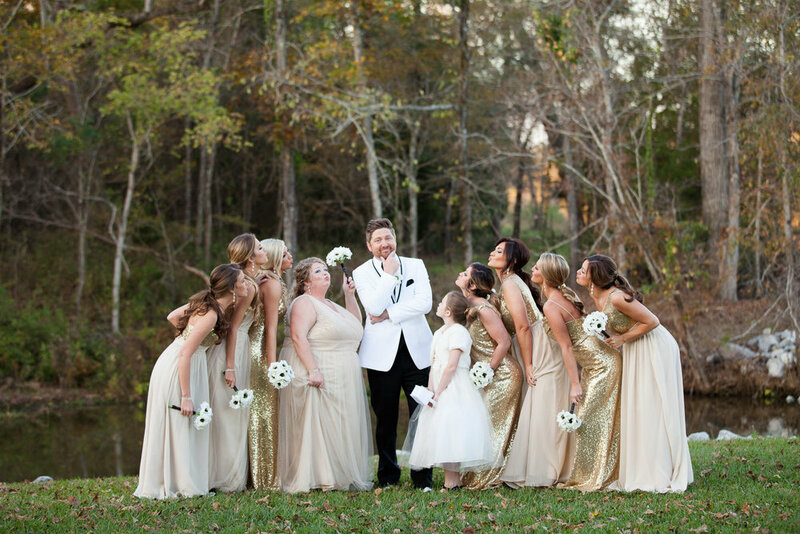 The Flower Girl Wedding and Florist did an incredible job on all the florals! Now that's you've had a peek behind the scenes, let me tell you a little bit about Mr. Michael Miller. Y'all, we've known Michael since he was in high school! I began my life as a believer in Christ at his uncle's church, where we all worshipped and served together. I like to say that Jonathan and I grew up as believers under Pastor Kenny and Mrs. Deborah Gardner! The Miller and Gardner families have been a very special part of our lives since we were goofy college students! I have no way of measuring or describing the deep impact they have had on our lives, and we are by far not the only people who have been blessed by knowing them. Here he is, arriving on his big day! 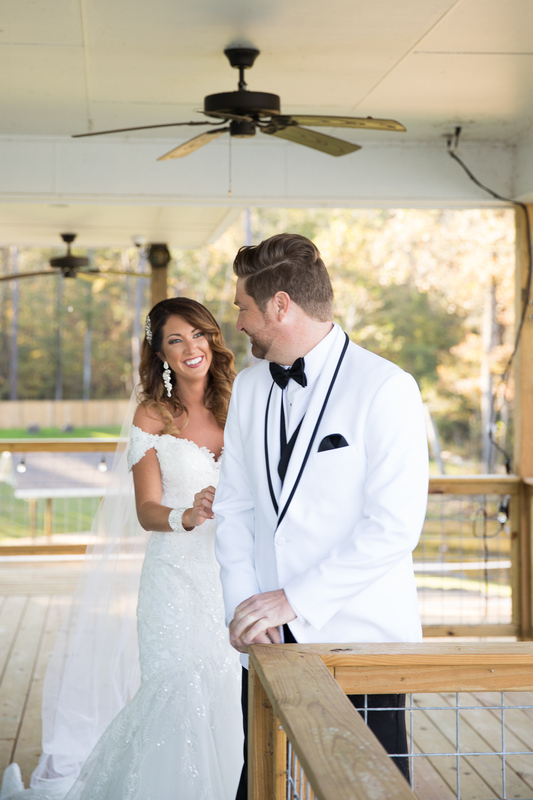 Mom brag warning: these images of Michael getting ready were captured by our son, Eli! He had a wonderful time following the guys around as they got ready! There's a beautiful heritage of Godly men and women on both sides of Michael's family. It's been awesome for us to watch Michael find and answer the unique call of God on his own life. When we joined Vibrant Church several years ago, we were so happy to see Michael using his gifts on the worship team. He's now serving, leading, and encouraging as our West Campus Pastor! 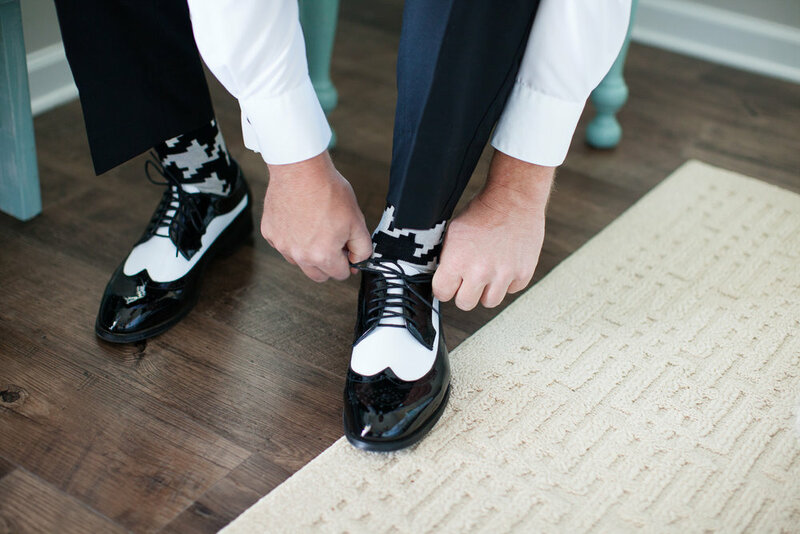 Groom footwear on POINT, y'all. I've already told you a little about sweet Juliana, but let me tell you more about her & her wonderful family. We've also known the Stillmans for many years. They are a kind, loving family, and like the Millers, they are well known and active in Columbus. Like Michael, Juliana serves on the worship team at Vibrant, and during the week she is a beloved teacher at Caledonia Elementary. Is this helping to paint a little picture of how well loved these two are in our community? 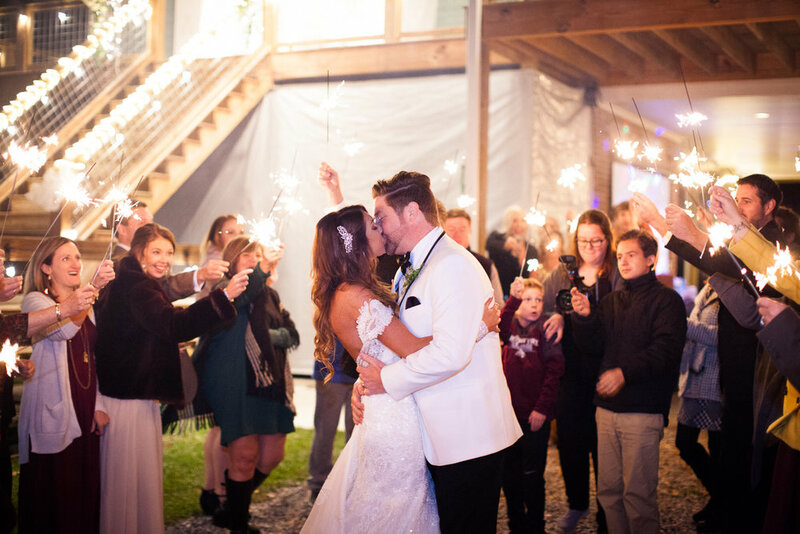 Juliana was gorgeous in her gown from The Bride and Groom Bridal Boutique! Her lovely bridal hair and makeup look was created by Hilari Forrester. 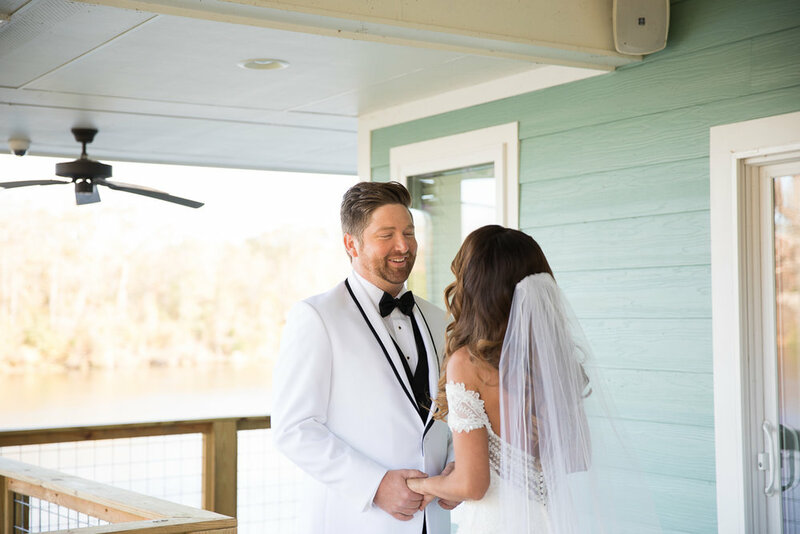 Only at riverside weddings do you have to wait for a barge to pass (and wait for the groomsmen to finish making the captain sound the horn) in order to have a First Look! So, y'all, can you understand how I kind of felt like I was getting to participate in a royal wedding with these two? I couldn't wait to see their First Look moment! 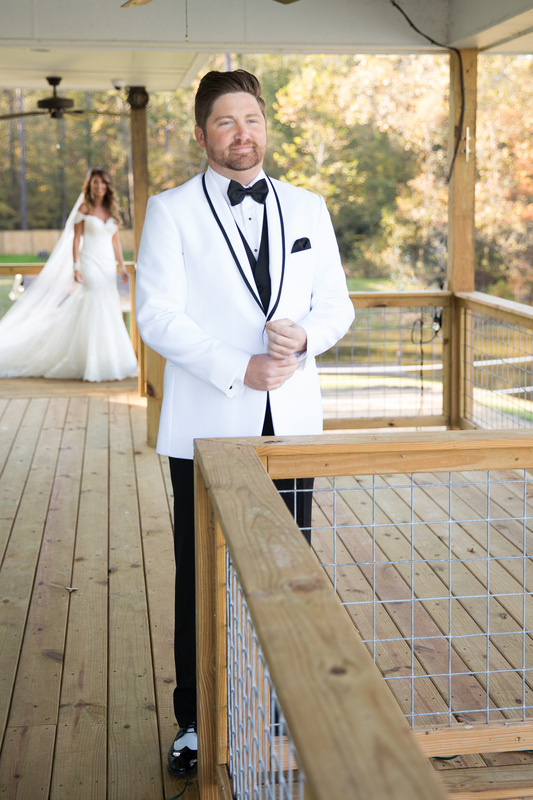 Yes, this moment is precious, but let's all just take a second and admire how Michael is rocking that white tux from The Bride and Groom Bridal Boutique! I think Michael stopped breathing for a second or two when he saw Juliana! I couldn't have asked for more beautiful golden hour light than what we had for Michael and Julian's bride and groom portraits. There's something magical about November evening light, y'all. It just kept getting better and better! one more closeup of this gorgeous cream, gold, and black bouquet by The Flower Girl Wedding and Florist... there was just the tiniest dusting of gold glitter on the roses! And then we got to have fun with the wedding party! Can you guess who took this one? ... Yep. Eli! As the sun went down behind the trees, car after car of guests followed the signs through the tree-lined gravel roads to the Stillman Lake House. 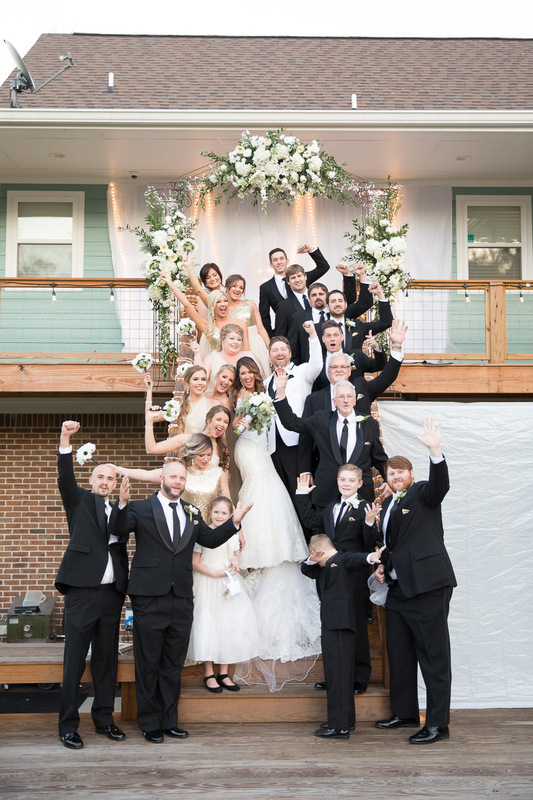 They found the lower porch and yard transformed into an elegantly decorated black and gold wedding venue. 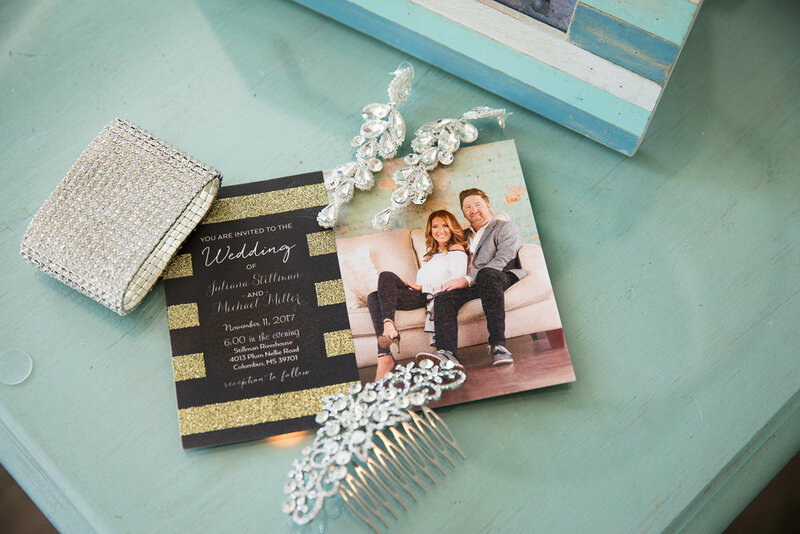 The bold beauty of Juliana's black, white and gold color scheme really sparkled after dark! That sweet MSU themed Groom's cake was the creation of Taylor Massey of Taylor Made Cakes! Michael and Juliana led their guests in worship as part of their ceremony! It was such a beautiful moment! When daddies cry, I cry. And then, the moment we'd all been waiting for - these two sweethearts officially became Mr. and Mrs. Miller! 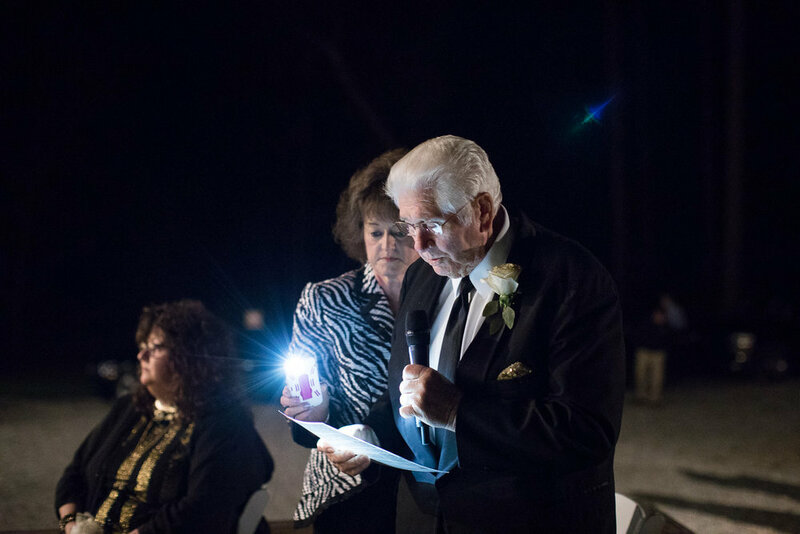 After the ceremony, the guests were treated to music by DJ Aaron Kelley and other Vibrant Church friends, and a hearty home cooked supper by Terry and Bernice Lile. There were SO MANY fun moments at this reception, but one of the highlights was Michael's very ENTHUSIASTIC retrieval of the garter! At the end of an evening filled with laughter and joy (and a little MSU football - it was November 11, y'all, the MSU vs. Alabama game day!) 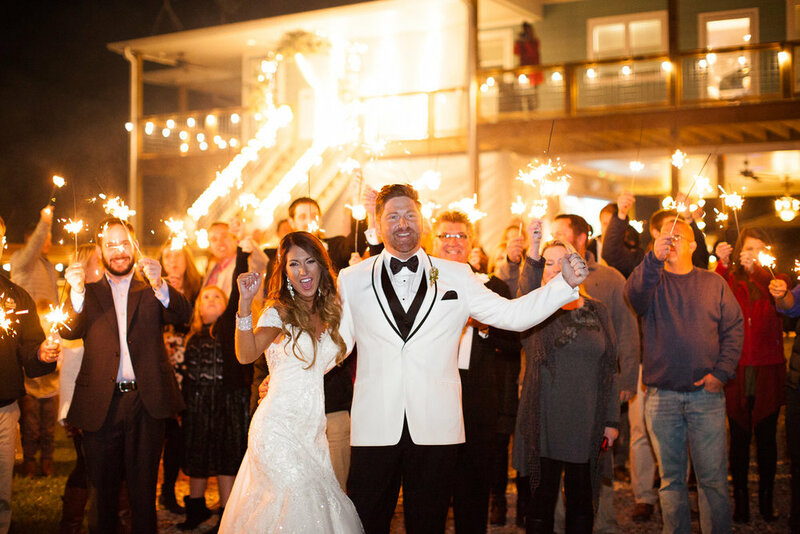 fireworks and sparklers sent Michael and Juliana off into their new life together. I spy a photographer in a red coat...can you find her?? 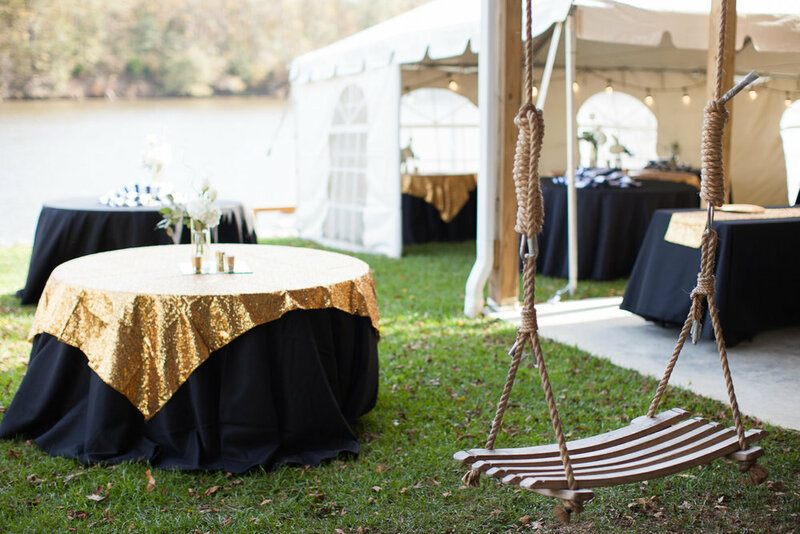 This November wedding by the river was like no other wedding, y'all. 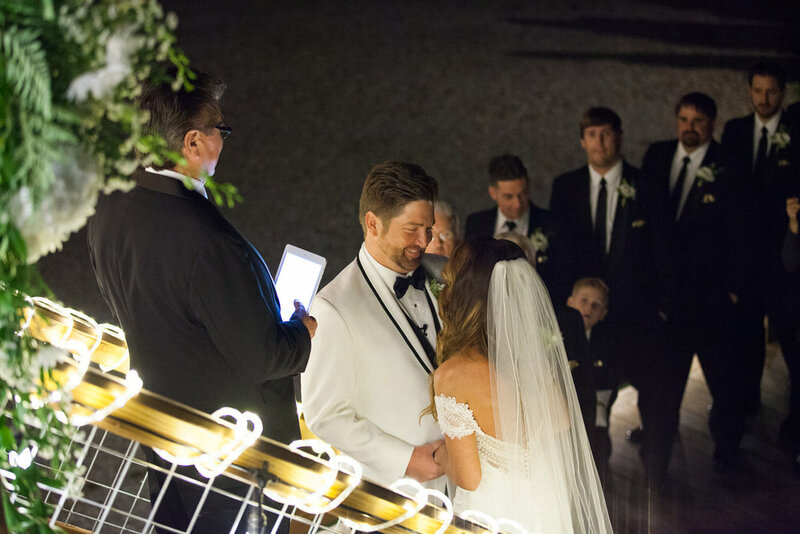 It was perfectly lovely, and just PERFECT for these two sweethearts! The three of us enjoyed every minute of it. It was a joy to watch these two find each other, and a it was privilege beyond all blessings to see them say "I do!"